Sugar. It is killing us. Why do we eat so much of it? What are its hidden dangers? We should have heeded his warning. Today, one in four adults in the UK are overweight. There is an epidemic of obese six-month-olds around the globe. John Yudkin (1910-95) was a British physiologist and nutritionist, whose books include This Slimming Business, Eat Well, Slim Well and This Nutrition Business. 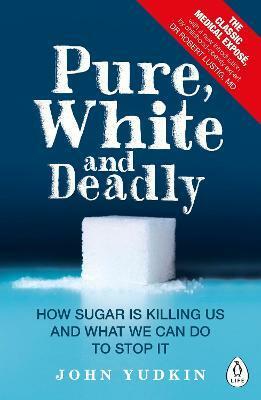 He became internationally famous with his book Pure, White and Deadly, first published in 1972, and was one of the first scientists to claim that sugar was a major cause of obesity and heart disease. Robert H. Lustig, MD has spent the past twenty years treating childhood obesity and studying the effects of sugar on the central nervous system and metabolism. He is the Director of the University of California, San Francisco Weight Assessment for Teen and Child Health Program and also a member of the Obesity Task Force of the Endocrine Society. His YouTube video lecture, 'Sugar: The Bitter Truth', has received over six million hits, and his book Fat Chance: Beating the Odds Against Sugar, Processed Food, Obesity, and Disease was first published in 2012.